Kelowna gets the Stanley Cup before Vancouver! The Vancouver Canucks survived such a scare against Chicago! To quote goalie Roberto Luongo: "We didn’t script it this way, but you know what, all year long when our backs were against the well, we responded." Check him out today on "Pardon The Interruption." The NHL is trending thanks to social media - and some great playoff action! 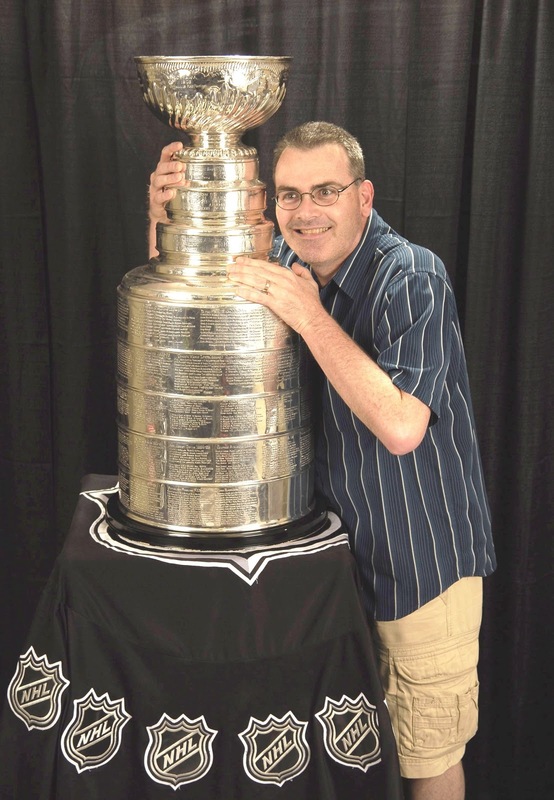 Can you believe the Stanley Cup made it to Kelowna last night before the big game? It was through my Twitter friend, Bruce Stranaghan, that this photo of yours truly happened. Bruce has social media skills! I find that too many folks do NOT know how to use social media properly or respectfully. For that reason, I dropped two folks for the first time on Twitter today since I started using it back on March 4. Vancouver singin' the Chicago Blues! to screaming lead guitar pyrotechnics in a heartbeat." It looks like 1957 was the year the now 74-year-old Buddy Guy left Louisiana to make his mark in Chicago. That year Montreal beat Boston in the Stanley Cup final and again in 1958. In 1959 and '60, Montreal took home the big prize against Toronto but in 1961 Chicago won the Stanley Cup against Detroit! Of course, the Chicago Blackhawks did not win it again until last season. They are now on quite a comeback trail against the Vancouver Canucks - winning their third straight playoff game yesterday! Game seven is tomorrow night in Vancouver. A Chicago radio station with The Danny Mac Show had some fun today at Roberto Luongo's expense on "Luongo Weeps Tonight." Striking back at Chicago is this four-year-old singer named Violet. I am hoping the Canucks will be conquerors tomorrow! This collapse was inconceivable the last time I blogged. This headline from yesterday's Okanagan Sunday was a perfect follow up to my last blog post: Crunch time: NHL playoffs = beards! Unfortunately, our hometown Kelowna Rockets were eliminated from the WHL playoffs last night against the Portland Winterhawks, 4-2. That ended up being the best-of-seven series result as well. Seems to be a popular hockey score right now as the NHL playoffs tonight saw Philadelphia beat Buffalo, 4-2, and Boston do the same to Montreal. Vancouver's old NBA team won their first ever game in the NBA playoffs yesterday. Congratulations to the Grizzlies in Memphis! They won a showdown with the San Antonio Spurs, 101-98, with Toronto Raptors announcer Matt Devlin on the mic. Crunch time: NHL playoffs = beards! The Vancouver Canucks start their quest for the Stanley Cup at home tonight against the defending champion, Chicago Blackhawks. The word just came down on Twitter that the @VanCanucks hashtag for Round One is #3venge. Chicago has beaten Vancouver in the last two playoff seasons so we are taking revenge this time around! Chicago 2010 wins Cup! Chicago 2011 NOT smiling! My picture to the left sums things up. Last year, Chicago had much more size (crunch!) in the lineup but they are too smooth now - missing big boys like Dustin Byfuglien and Andrew Ladd, who are playing in Atlanta. Playoff beards are a hockey tradition but beards are sprouting in baseball bullpens! Gary Bender calls his final game tonight after 18 seasons with the Phoenix Suns. He spent 45 years in broadcasting and called 27 sports for CBS. Thanks for the memories Gary! Brian Butterfield. He dreamt about having that number. High 5's for Friday include the Sabres and Luongo! Dan Russell just mentioned on the broadcast that this series is the 55th in the history of the Saskatoon Blades. They trail Kootenay 3-1 in the third period. Roberto Luongo had his 55th career shutout last night as the Vancouver Canucks beat Minnesota, 5-0. We haven't done FFF (Justin Bieber edition) since February 18. Meanwhile, it's #FF on Twitter: #FF stands for "Follow Friday." Twitter users often suggest who others should follow on Fridays by tweeting with the hashtag #FF. Thank you for the mentions today Anne Ganguzza and NHLMedia! My Facebook status last night: Bring on the Cup! The Vancouver Canucks can become the 1st NHL team in ‘expansion era’ (from 1968 on) to lead in goals for/against, PP and PK in same season. Thursday morning Facebook status: The cat is out of the bag...BATS are out of the (duffle or duffel?) bag! GO Blue Jays! My Wednesday afternoon Facebook status: Yes, I took part in Whopper Wednesday...Did you know a Whopper contains HOPE? So does this local Kelowna blog: Buddy Breathing. ‎Congratulations to Leslie-Anne's parents for hitting 50 years of marriage today! Wow! 2 were movie trailer reads. Phone FUN! ‎Monday morning Facebook status: The Final 4!! Basketball and days left in March...I like tomorrow (29th) as our son, Jordan, turns 16. I will also pick Kentucky to win the Final 4. *We will know if I'm right on Monday, April 4th...Until then, have a great weekend!